The Rio Grande is one of the principal rivers in the southwest United States and northern Mexico. The Rio Grande begins in south-central Colorado in the United States and flows to the Gulf of Mexico. Along the way, it forms part of the Mexico–United States border. According to the International Boundary and Water Commission, its total length was 1,896 miles (3,051 km) in the late 1980s, though course shifts occasionally result in length changes. 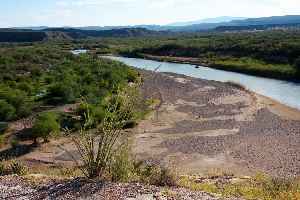 Depending on how it is measured, the Rio Grande is either the fourth- or fifth-longest river system in North America.